Eat Your City: Highlands Kitchen Edmonton, AB - Amazing food hidden at your neighbourhood cafe - and those slow cooked bison ribs!! 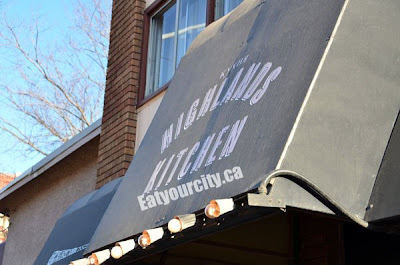 Highlands Kitchen Edmonton, AB - Amazing food hidden at your neighbourhood cafe - and those slow cooked bison ribs!! With one of my best buds in town, we swing by this little gem tucked away in the Highlands area. Located in a quaint little neighbourhood, Highland's Kitchen goes above and beyond what anyone would expect from a little neighbourhood cafe. The decor is a blend of Victorian welcoming rustic charm and a touch of class. 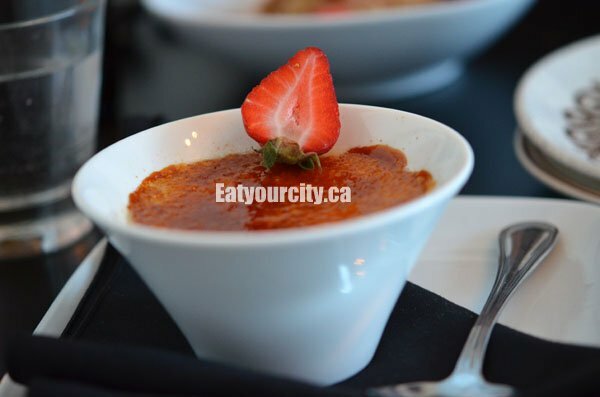 The Canadian-fusion menu is polished with a focus on locally sourced ingredients, and supporting local businesses, plus excellent service. In 2009, it was awarded En Route Magazine's top 10 new restaurants in Canada - and I would have to agree - it's definitely up there with Red Ox Inn! But I'm getting ahead of myself, so read on! 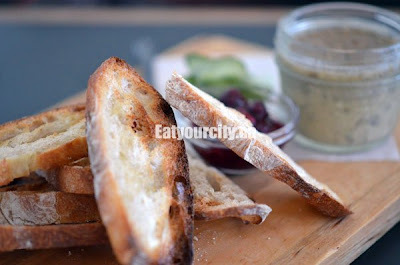 The sunflower seed pate is vegan, and we were pleasantly surprised - it was quite savoury with a hint of earthy nutty sunflower seeds, blended into a velvety creamy texture, and paired well with the tanginess from the cranberry sauce atop of the crisp freshly toasted crostinis. 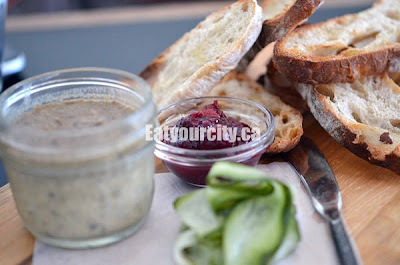 I think I was supposed to eat the thinly sliced pickles with the pate, but they were great on there own. Mmmmm. 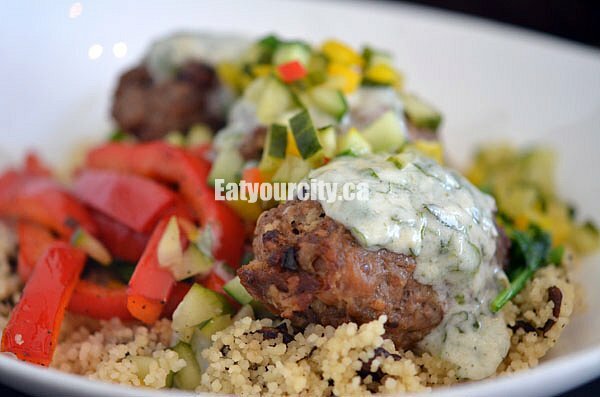 These tender savoury lamb meatballs were smothered in a horseradish-cilantro cream and served with wilted greens and a refreshing cucumber relish over a flavourful mushroom & feta couscous. The meatball was very moist and delicious. The dish as a whole was well composed and my fellow foodie enjoyed his entree. 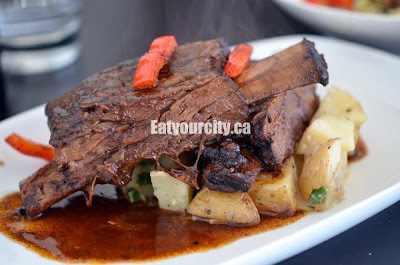 These amazing fall off the bone tender moist slow cooked ribs were hit with a balsamic glaze, and served with a warm roasted garlic rosemary potato salad and seasonal vegetables. This bison was soooooo incredibly tender, super moist and flavourful. I made these ribs disappear in record time. Wow. It would be a crime to finish off our meal without making room for dessert after Highland's had set out such great food. This defines simple homemade happiness. 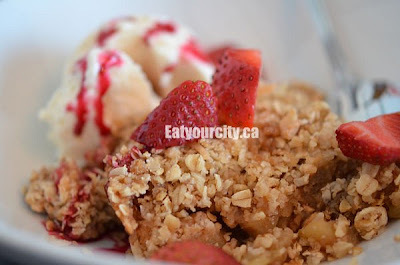 Warm apple crumble, overtop of brown sugared and super cinnamon mooshy-firm baked apple slices. Mmmmm! The oatmeal crumble part was a bit on the moist and mushy side rather than the crisp crumble I was expecting. Paired with some ice-cream, fresh strawberries and a bit of strawberry sauce - It was an ice-cream sundae and apple pie a la mode all in one - great way to end my meal. We went for dinner at 530pm and they only had ONE left!!!!! We wanted one each - boo. Next time, I'm getting the dessert first lol! 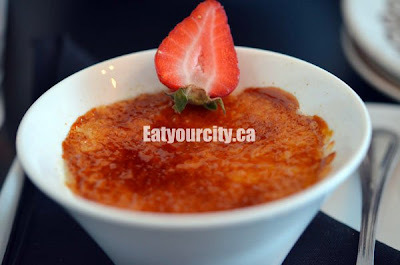 The burnt sugar coating was very very thick, though the creme brûlée was quite good - velvety smooth creaminess with hints of chai flavour - tea, cinnamon and spices. 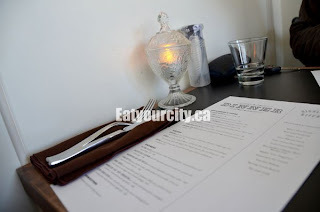 Overall, its quite apparent both the Chefs and staff take pride and passion into their well thought out and tasty dishes - a great restaurant disguised as a little neighbourhood cafe. Isn't this place being featured on You Gotta Eat Here? Hey - it is! :) Now I have to youtube up the episode or wait till they rerun that episode on tv :P Thanks for the heads up! Need to correct you - it is located in the Highlands neighbourhood... hence, the name. Perhaps you would have noted this on the Google map with your post. I think the name Highlands Kitchen would give away the fact it is not in Beverly. Sadly, restaurant closed.. while hopefully reopen in new location early 2013.